Membrane interacting peptides play essential roles in cell fate. They may kill cells or help them in adapting to external constraints. As an example, the increasing resistance of bacteria to conventional antibiotics has pushed for the development of new modes of treatment and over the past few years, antimicrobial peptides (AP) have been presented as a potential solution to this problem. Whereas classical antibiotics act specifically on biosynthetic pathways, antimicrobial peptides may directly destabilize the lipid membrane and constitute a promising alternative strategy for fighting microorganism action. There is also a second class of peptides that are not antimicrobial but are rather targeted to the membrane interior as part of membrane proteins or signalling molecules and participate to membrane stability and function. Whereas some of the latter may associate as bundles to form membrane protein pores, the AP are rather small and were first identified in the hemolymph of insects. As early shown by Nobel Prize Jules Hoffmann insects are indeed the first species producing such peptides as part of a systemic response induced by microorganisms. 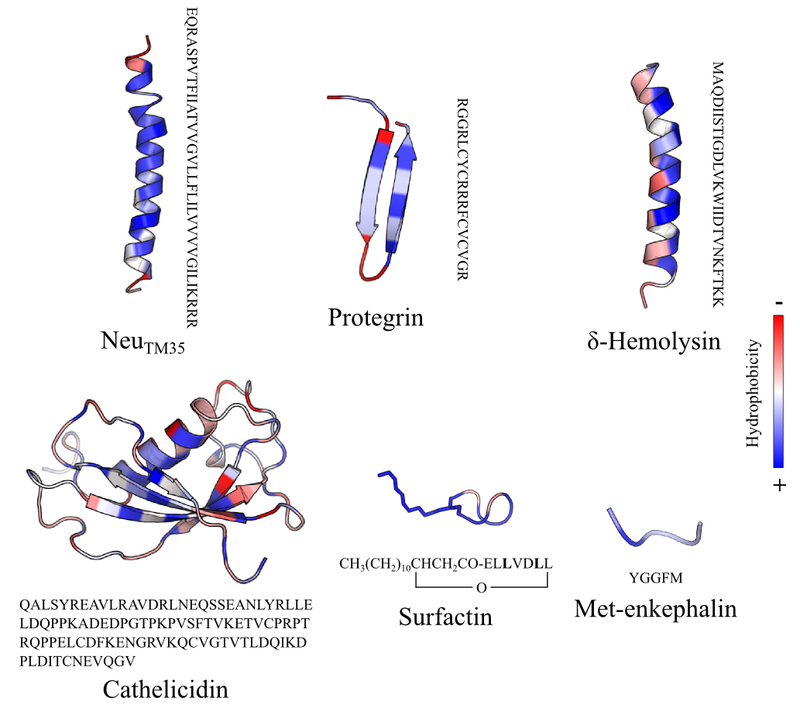 Membrane peptides are amphipathic and fold within a large variety of secondary structures: helices, beta-sheet, cystein-stabilized alpha helix and betasheet strcutures, cyclic lipopeptides, small unstructured signal peptides. They are chemically or biologically synthesized and isopically labelled and their mode of action on membranes is studied by NMR, light scattering, IR and UV spectroscopies, electron microscopy, electrophysiology and molecular dynamics. Several mechanisms of action such as domain segregation/solubilization (melittin), molecular lectroporation (cateslytin), electrostatic wedge (surfactin) have been evidenced.